Warren & Brown Technologies (WBT) is pleased to announce that our new and refreshed WB Networks e-commerce website is live. The newly designed site has a fresh look and feel, creating a user-friendly browsing and shopping experience for its valued customers and business partners. As a leading Australian owned and operated business, and major supplier to many Telecom Carriers and Enterprise networks globally and locally, this extension of WBT’s impressive track record of service and innovation takes its product and service offering to a whole new level. 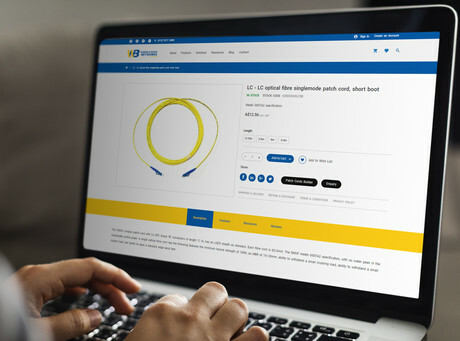 With access to over 3,000+ quality products, including the HypaConnect copper and optical fibre cabling solutions, ducting raceway, telecom carrier connectivity products, patch cords, accessories and much more, at competitive prices, the new site is a cornerstone of WBT’s leading service offering. The new design provides enhanced navigation, search function and product filtering capabilities in each product category. These new features allow customers to define and have more control over their shopping experience. Customers can now narrow product selections by preferred attributes, or quickly search for products by name, type or part number. These new capabilities make the site very useful for evaluating product options before placing an order. Offering express delivery options, fast order turnaround time, secure payment options, live chat, ongoing specials and promotions for the Australian market, the website will provide WBT customers with even greater responsive service and delivery of key network connectivity infrastructure solutions. And for more complex network requirements and end-to-end solutions, the WBT sales and technical teams will continue to engage with customers on a regular basis. The responsive design of the new website adjusts and responds to various screen sizes, so the site can easily be viewed on desktops, laptops, tablets and mobile phones. Moving forward the content will be updated regularly, providing customers with new product offerings, technical support, product information and responsive service. To top it all off, there’s an introductory offer of 10% off all products purchased from the new online store. To access the discount, visit wbnetworks.com.au and enter promo code: WB-ONLINE10 at the checkout. This offer is valid for online orders only until 31st March 2019. Warren & Brown Technologies (WBT) was originally established in 1921 as a tool-making factory in Melbourne, Australia. Over the years, the company has evolved to become a leader in precision tools and telecommunications network connectivity infrastructure technology. WBT has remained proudly Australian owned and operated for over 97 years, committed to the local design, manufacturing and technology industry. This commitment has resulted in the creation of hundreds of jobs and world leading solutions. The professional team at WBT continues to lead the way in designing and manufacturing telecommunications hardware products, which have been deployed in countless networks around the world. We pride ourselves on being a global leader in the supply and manufacture of optical fibre and copper communications equipment. Innovative designs, attention to detail and a willingness to go above and beyond the requirements of our customers are what establishes WBT as the industry benchmark. As we look towards the exciting and dynamic future of the telecommunications industry, our history and experience gained over the last 97 years ensures that we are well equipped for the challenging times ahead.